One of our most popular services that we provide is Natural & Organic Tick & Mosquito Control. Lyme disease may be carried by ticks while West Nile may be carried by mosquitos. 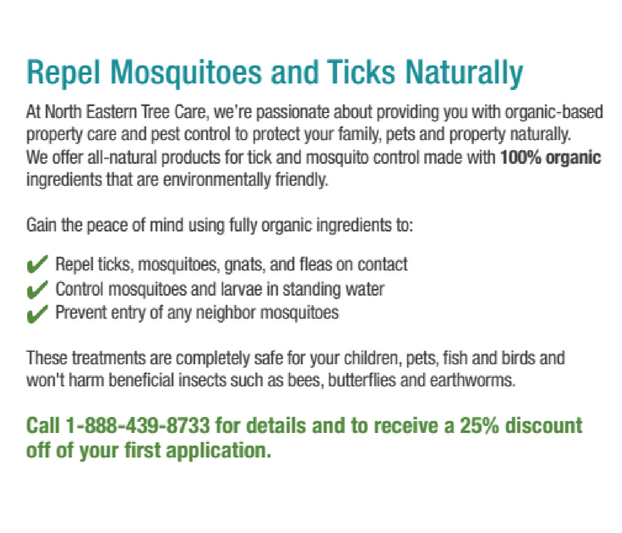 North Eastern Tree Care of Yonkers, New York provides a fully organic and biodegradable product which helps treat and control Lyme disease carrying ticks on property. The great thing about this treatment is that it is effective whether your neighbors use it or not. It protects property at the barriers of your lawn. Each of the products we use are environmentally conscious for ticks and flee. We use organic cedar oil for natural tick control. We create the program based on unique conditions of property as well as any preferences our customers may have. Damminix is the only proven treatment to successfully control Lyme disease ticks on your property. This is great because it works on your property whether your neighbors use it or not. Combined with environmentally conscious tick and flea spray treatments, you can set your mind at ease while your family enjoys the pleasures of a lush, green property. Natural and organic products are safer for your lawn and your loved ones. Other products may wash away easily but our product is the best of the best and can help prevent ticks and mosquitos so that you can enjoy your time outside. Our certified lawn care technicians are well knowledgeable in mosquito and tick control and are able to determine what to do upon arrival at your home. This is one of our most common services meaning that we have mastered the art of helping your lawn become a safer and more enjoyable experience for you and your family. We pride ourselves in our ability to help our customers understand what must be done in order to control the insect and pest populations on their property. In the case that you are sick and tired of your property being filled with mosquitoes and ticks, we can help you. 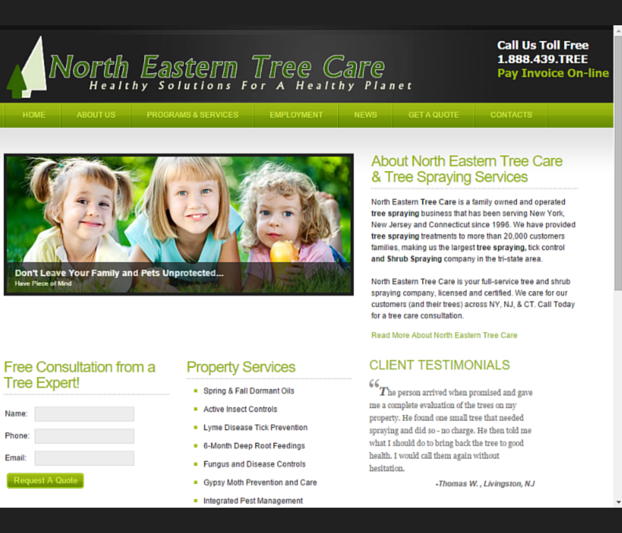 North Eastern Tree Care of Yonkers, New York, offers a great Natural & Organic Tick & Mosquito Control plan of action. If you're looking for a team of experts who know their lawn maintenance, you have found us. We can create a plan for your specific lawn. When we're done with your property, you won't have to worry about ticks or mosquitoes. You can enjoy those warm summers nights again. You won't have to stay inside any longer. Call us today to talk to one of our expert arborists.